So, I’m new to blogging and I’m just finding my way around that and WordPress. I started this blog mostly as a photographic blog about things that I love to do and that are important to me. I started with the new baby elephants at the Fort Worth Zoo. I missed out on visiting the zoo, for whatever reason, when Asha, the baby Greater One-Horned Rhino was born last year (August 2012) and I couldn’t let that happen when baby Belle (the baby Asian Elephant born in August 2013) was born. I was there the week she was introduced to the public. As I always do, I took so many photos of that cute little baby girl. Then in September, the Fort Worth Zoo announced that another baby elephant was born! This one was a boy, he’s named Bowie (pronounced Boo-ey… odd for me since I am from New Jersey and we do not pronounce Bowie that way, after all, David Bowie is not David Booey, and the name Howie, is not Hooey…. but… I am trying my best to pronounce it right, since that’s how they say it here in Texas). Anyway, I became so intrigued with these elephants. I missed going to the zoo for the first week that Bowie was introduced because my brother and his wife were visiting from Pennsylvania. We did go to the zoo and we saw Belle… and of course, just my luck, Bowie was announced the day after we visited the zoo. So I went the following Friday with my daughter, who was visiting for the weekend from Midland, so we could see little Bowie. Bowie was not on exhibit, but Belle and her mom Rasha were…. I really wanted to see and photograph Bowie, so this became a sort of obsession with me. The following Monday, I became a zoo member, so now I can come and go as I please without going broke. Bowie did not come back on exhibit until about two weeks later, he was a little underweight and he and his mom, Bluebonnet, needed some extra time for the bonding process. If you like check my other blogs and look at the photos and you can read a little about my experiences there. I am not a writer, actually I am a terrible writer! I am very active on Facebook, putting out random thoughts and things that I do, but they tend to get lost in the shuffle, so now I am thinking about putting different thoughts here on my blog. I will not put anything out here that I will regret and I won’t say anything about anyone that would make them uncomfortable in any way, this is just my blog about me and some of my thoughts and things that I do. I am older, I won’t say how old… some people think that’s wrong, but to me, I don’t like to think about the numbers. I don’t feel anywhere near as old as I am, so that’s that… and that’s all I will say about my age. Years ago, women (mostly, but I’m sure some men too) were able to hide their age. My grandmother would never admit her age, and even now, we are not exactly sure which year she was born.. 1909? I don’t know… but it wasn’t important. She died in her early 70’s. She went into the hospital, I think because of a stroke. No autopsy was done, so we are not sure of the actual cause. Anyway, in today’s world with Facebook, classmates, and all of those google searches, one can no longer hide their age…. so, I just ignore it and don’t talk about it. I am married, for 32 years now and I have a daughter that we adopted from Pereira, Colombia in 1987, she was 19 months old, when we adopted her. The most beautiful little baby girl ever!This is me and Rachel in Pereira, Colombia, our first week together…. my husband, Tom, is taking the photos. I lived in New Jersey for my entire life until 2008 when we moved to Fort Worth, TX. We wanted to move someplace less expensive and with shorter winters. I fit right into Fort Worth, other than the ride down, it was a seamless move. My husband travels, he travels very often so I spend a lot of time alone… well, not really alone because I have so many activities that I do. I am a dancer (yes, I can say that now, read my other post about how I can now call myself a dancer) and a photographer. I love tennis and took lessons for maybe 10 years now (I never realized it was that long.. I guess I should be a lot better at it than I am now that I think about it!). 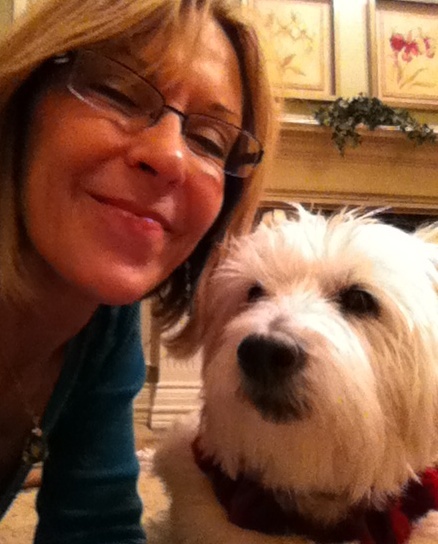 I haven’t taken many lessons this past year (2013) because starting the year, my dog, Fluffy, a Westie, was sick and diagnosed with nasal sarcoma. It came on very quickly. She started sneezing one morning before Christmas in 2012, and blood was coming out… a lot of blood. I rushed her to the doctor and I was convinced it was just polyps… the doctor warned me that it might be something more serious, but I really did not believe him. 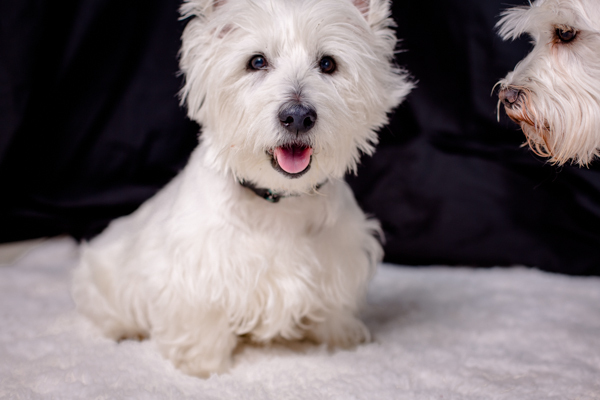 During one of my boudoir photo shoots in December, while I was waiting for my client to change, I took some studio photos of Fluffy and Bentley. I am so happy I did because those were the last studio shots I took of her. And looking at these photos, you would never have known what was to come of her. We ended up taking her to a specialist in Dallas… I was still convinced that it was polyps or something fixable. It wasn’t, it was an incurable form of cancer, nasal sarcoma, and a tumor was growing quickly in her head… by the time the New Year came, she was changing. Her face was different and you could see that the tumor was growing and changing the shape of her face. She was a trooper though, she never let us know that she was in pain. She had trouble breathing, I guess because the tumor was growing in her sinuses… It was affecting her right eye and I’m sure she had trouble with her vision because of it and she was always sneezing blood. I had towels and sheets all over everything because of this. The doctor suggested that she sleep in a crate, but Fluffy was never crated, I couldn’t do that to her, so I just put a lot of old towels and blankets on the bed and that’s where she slept, just as always. I did a lot of laundry, but I could not change her life just because she was sick. I worked out at the gym 3-4 days a week for at least 5 years, but when Fluffy became sick, I had to slow that down a lot… I would just sit with her or lay down with her… I had to make her comfortable and I wanted her to be fixed. She was on meds that were supposed to slow the progress of the tumor and I also had her on some Chinese herbal therapy, hoping to stop the bleeding and the progress of the tumor. The doctor said it was a very aggressive tumor, but even he was surprised at how quickly it grew. On Feb 7, we made the decision to let her go. She didn’t look like herself anymore because of the tumor, she had trouble breathing, but she was happy. The doctor said it was time, probably a few weeks before we actually made the decision. I can’t go into the day that it happened, it still makes me cry. Fluffy was so much more than a dog, she was a part of me and our little family. Anyway… we still have Bentley, he’s 4 1/2 now… and a new little Westie called Pippa. She was born Feb 3. She will never replace Fluffy but she is her own special little dog and we love her and Bentley to death. It took Bentley a little while to get used to Pippa… but they are very close now. Here is my latest little photo of the two of them that I took with my phone yesterday and also a photo of me and Pippa, also taken this past week. I didn’t plan on writing so much… so now that my time has gotten away from me, I will end this now. I had so much more to say, but that will have to be for another day…. Thank you so much for the nice words! And yes, my little doggies are very sweet and so much fun! I see you are an animal lover too! Thank you again!